Farm-fresh eggs. Locally grown tomatoes. Herbs sourced onsite. If you’ve eaten out recently, you’ve probably noticed the menus feature locally sourced ingredients. The farm-to-table movement continues to flourish at restaurants throughout the country. You can take a cue from this hot trend by starting your own farm-to-table concept garden at home. Just imagine plucking ruby red tomatoes and rich green basil straight from your garden to make a farm-fresh, scrumptious caprese salad without ever leaving home. An at-home take on the farm-to-table trend can easily be translated to a convenient "garden-to-table" concept in your own backyard. Growing your own at home will elevate your cooking and you'll feel good about being able to produce your own food while lowering your grocery bill. No matter the size of your garden space, you can grow fresh foods that are readily available right at your fingertips, even if you just have a small patio or balcony. What's more, some of the most popular produce to eat is also easy to grow. Caged tomatoes - Whether you choose big, juicy slicers or sweet cherry-sized snackers, caged tomatoes are easy to grow and offer endless cooking opportunities. Determinate varieties of tomatoes are container favorites because the vines are relatively compact yet bear a productive harvest. Or create your own container garden using tomato varieties especially bred for small spaces. Caged peppers - Try popular and versatile Green Bell, a heavy yielder of large fruits and a good all-round pepper for slicing and stuffing. Or, spice up your recipes with jalapeño chile peppers, which yield a bountiful harvest. Strawberries in hanging baskets - Sweet, juicy strawberries add loads of flavor to salads, dressings, drinks and desserts. Think you need a plot to grow a productive strawberry patch? Think again. Maximize space with strawberries in hanging baskets, which are everbearing and produce cascades of berries throughout the growing season. Herbs in combo pots- Want to raise the flavor profile of any culinary dish? Fresh herbs are your best bet. 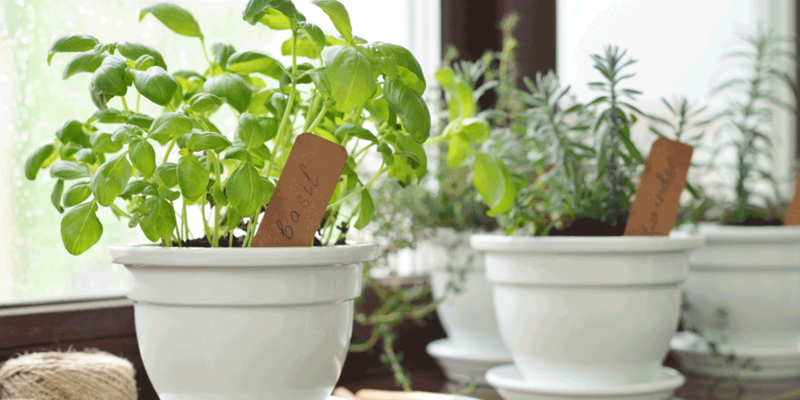 Herb gardens can be grown in compact spaces, which means you can fit your favorites in no matter how much space you have. For example, a kitchen herb combo container featuring sweet basil, cilantro and curled parsley is a powerhouse pot that's both practical and pretty. You can set it right outside your door for convenient access and continuous harvest. Herbs are ready for harvest upon purchase and will keep growing and giving all season long. Once it's time to harvest, have fun exploring new recipes and experimenting with home-grown, fresh-picked produce that will shake up your supper and then some. For more inspiration for easy at-home gardening, visit bonnieplants.com.